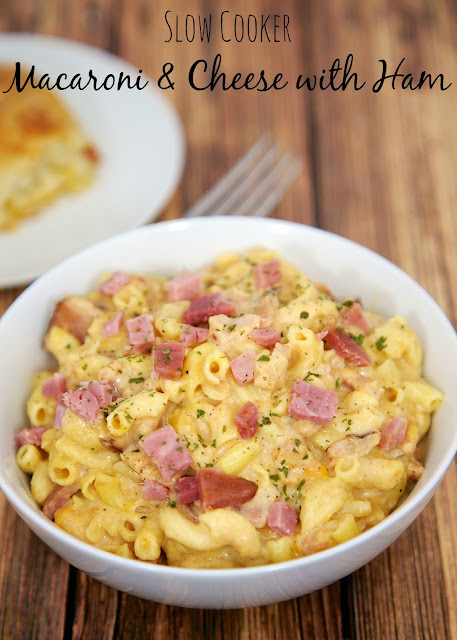 Slow Cooker Macaroni & Cheese with Ham - great flavor and ready in 90 minutes. Can serve without ham as side dish. I had some frozen ham in the freezer that I wanted to use up. I've made a slow cooker mac and cheese in the past and thought it would be a great main dish with the ham. This recipe is awesome! My favorite thing about this recipe is that the noodles cook in the slow cooker. You don’t have to boil the noodles ahead of time! AWESOME! This mac and cheese isn't something that you can let cook all day while you are at work. It only takes about 2 1/2 hours to cook. I loved the convenience of just dumping everything in the crock-pot a few hours before dinner. We both really loved the mac and cheese. It had a wonderful flavor. Feel free to mix up the cheeses – the combinations are endless! Slow Cooker Macaroni & Cheese with Ham - great flavor and ready in 90 minutes. Can serve without ham as side dish. Macaroni, ham, milk, dijon mustard, onion powder, garlic powder, paprika, salt, pepper and cheddar cheese. Our FAVORITE mac and cheese recipe!! 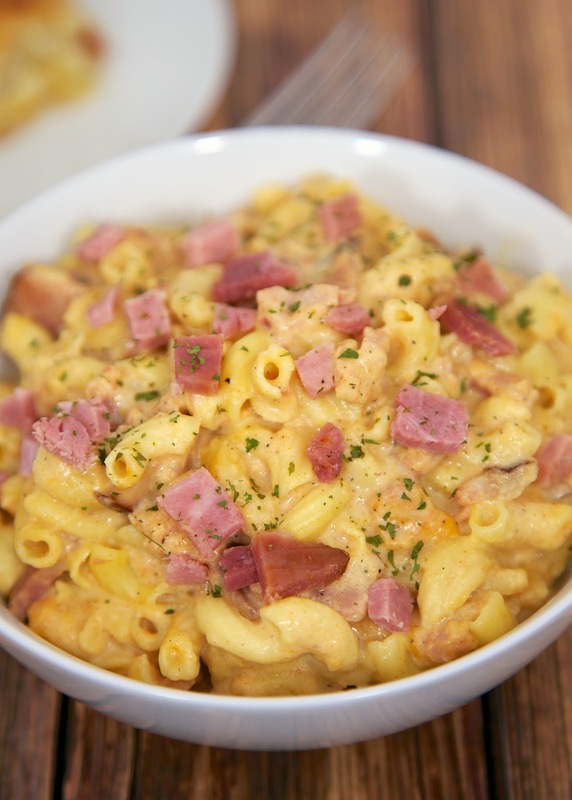 In a 6-quart slow cooker, combine macaroni, ham, milk, mustard, onion powder, garlic powder, paprika, salt and pepper. Cook on low for 1 hour. Stir, and continue to cook 1 hour more. Stir in cheese and cook 30 minutes. Since I prefer pan-cooked to baked mac & cheese, this really appeals to me. Perfect! I have some ham in the freezer right now and my family will love this. Thanks! I made your "One-Pot Baked Ziti" on Sunday. OMG my husband cannot stop raving about it. He said it is THEEEE Best Ziti he has EVER had and he is a true pasta aficionado. He absolutely ADORES mac and cheese so I cannot wait to make this over the weekend for him. Thank you for all your hard work and great recipes you share with us. What a great way to use up leftover ham and I love that you don't have to cook the noodles first! Is the green stuff in your picture basil? I plan on making this tomorrow night. Thanks! It is dried parsley. Enjoy! Thank you so much. I'm making it now. Did you know there is a problem with your Web site on the iPad? I'm on my desktop computer to look up ingredients because your site keeps crashing on my iPad in the kitchen. You probably pay for your Web space and you should know about this. I was on your site before and had that problem. It's not just this recipe. I'm really grateful for your recipes. I can print them out if I don't want to run back and forth between rooms, bu I thought you should know about this if you don't already.